JungleWatch: WHATEVER IT IS, FIX IT! WHATEVER IT IS, FIX IT! The mess that is RMS is reflective of the mess that has gone on in Rome for a very long time, including probably the selection of one Anthony S. Apuron (a topic we will take up one day soon). This is why it is IMPERATIVE that we throw off the COLONIZED attitude of always looking across the water for the Great White Hope to swoop in and fix our problems. Error and Evil must always be opposed whatever it is and whether anyone comes to our aid or not. 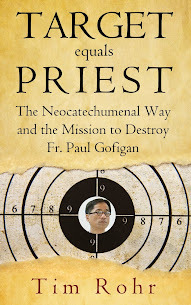 Our baptism has given us all we need to wage war with the demons who attack us from within and without...and I don't just mean the current task of ridding this diocese of a dangerously derelict bishop. Of course the graces of baptism are rendered effectual or ineffectual to the degree that each one's soul is free from sin. Maybe this is why so many of us do not want to rise up on our own, but continue calling out across the sea. Whatever it is, fix it with the Sacraments. The battle will rage far beyond the current dilemma. It is not our traditions, or our church, or our culture which is at stake. It is our souls. It always amazes me that the people of this island seem to always look for help elsewhere, whether it be the US Government or the Vatican. "WE" can take care of what needs to be taken cared of right here. In the case of our church, "WE" can do what is necessary to oppress evil and bring about positive change in our Church. Stop looking towards Rome, people. Know your Sacraments. Learn (in some cases, re-learn) what it is to be Catholic. Outfit yourselves with the truth. Ask yourselves, "What can I do to help?" Stand up and be counted. Raymond - This would probably be the 3rd time I would have commented on your comments in TOTAL CONCURRENCE with your thoughts. They appear to be not just much "to the point; hitting the nail right on the head", but I think well-thought out as well. Thank you. I wish I know you personally because you seem to be "a person after my own thinking in many ways", and would like to share my own thoughts with you as well -personally, not just publicly through these comments. I can be reached at . -jrsa (5/9/16). Mr. SA....you do know me. We've met several times at the CCOG meetings. Thank you for the confidence in what I say. You yourself, have been a beacon for my formation as a Catholic and Soldier for Christ. Thank YOU. Our Lord said old Satan can't win. We're safe from destruction and sin. Our church can then rot from within. Yes, there is a bit of a problem with this but still highlights a central issue. The problem is that the Cardinal appears to be a liberal and is not happy with the conservative picks. Thus he advocates for "theological competence" over "formal orthodoxy." This gets tricky when trying to understand our current situation. 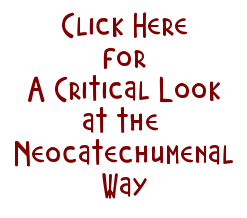 With JP2 came a resurrection of "orthodoxy" at least on some levels. Kiko, who could care less about anything other than power, aligned his movement with JP2's desire to return to "orthodoxy" especially in matters concerning the family and sexual mores (i.e. Humanae Vitae). In doing so he was able to position himself as an ally of JP2 and take advantage of the return to “formal orthodoxy” during his reign. To bolster his position and enhance his lobby, Kiko and his impostors maneuvered to get bishops into positions who were friendly to them under the guise of orthodoxy. What the Cardinal is complaining about is actually Kiko’s lobby, who like Cordes who was just here, are “orthodox” second and Kiko’s first. So while I do not support the appointment of liberal bishops - this is what got us in trouble in the first place, the subversion of the process to pick kiko’s bishops under the guise of orthodoxy is many times more dangerous. Maybe more on this later. It’s going to be confusion. Pope Francis’ “liberalism” is actually an asset in unseating Kiko and his lobby. LOL. Thanks for taking the time to explain this.